Shopping for Star Trek Model Kits? Add Enterprise-A to your Starfleet collection of model kits! Arguably the most popular version of Star Trek's starship Enterprise. Measures a whopping 35-inches long when fully assembled! Build, customize, and admire for years to come. This marvelous model kit of what is arguably the most popular version of Star Trek's starship Enterprise measures a whopping 35-inches long when fully assembled! The highly detailed, 1:350 scale glue kit of the U.S.S. 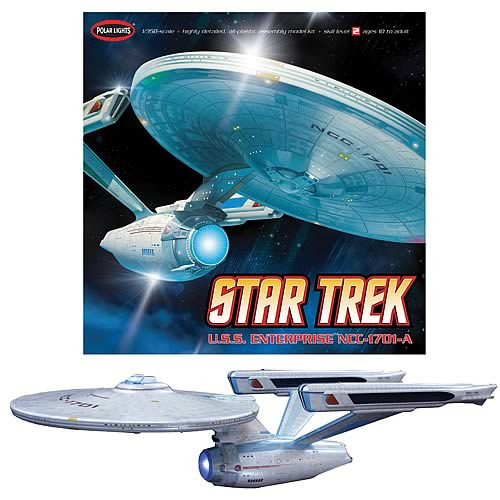 Enterprise NCC-1701-A features extraordinary detail that will satisfy even the most discriminating kit builder. It's a skill level 2 model kit that requires glue assembly and paint. Over 150 pieces. Ages 10 and up.